By the 1940s, according to World Wildlife Fund, there were no more than 40 Amur tigers remaining in the wild. The subspecies was saved when Russia became the first nation to grant the tiger full protection. Watching wild animals being returned to their natural habitats after an accident or injury is immensely gratifying and often thrilling. Restoring even just a bit of nature makes our hearts instinctively feel that a wrong is being righted. Our senses of justice are assuaged. Recently, on May 15, 2017, the world got one of those feel-good moments. After spending eight months confined in a rehabilitation center, an Amur (or Siberian) tiger, given the name of Vladik, was released into Bikin National Park in a far eastern province of Russia. Vladik was named for Vladivostok, the city in which he was captured by the use of a sedative on October 20, 2016. He had wandered into town, causing some to speculate that he was injured or sick. Male tigers, however, sometimes travel for miles when hunting or searching for a mate. Or, it could be that Vladik strayed from the perimeters of the national park he was taken back to, which is located about 350 miles away. At the time of his capture, Vladik was about three years old, just over 300 pounds and was free of injuries. His rehabilitation included testing for diseases, inspection and outfitting him with a location tracker. For his return to the wild, Vladik was again sedated and loaded into a metal crate. Rescuers from the tiger rehabilitation center, representatives of World Wildlife Fund Russia and Russia’s Natural Resources Minister Sergey Donskogo traveled with Vladik as he was flown to Bikin National Park in a small helicopter. 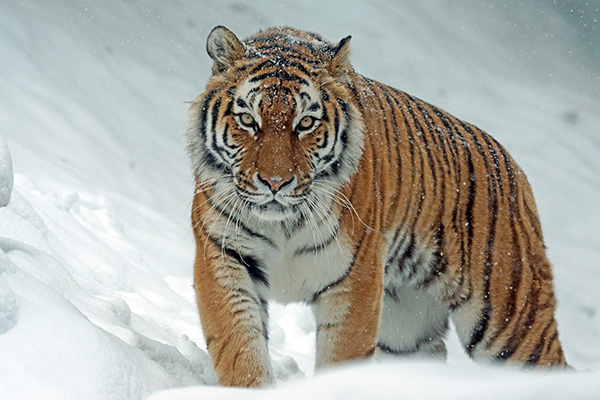 The park is home to 10 percent of the world’s endangered Amur tigers. Siberian tigers are a protected species in Russia. Since the 1940s, when it was believed that there were only 40 left, they have made a considerable comeback. Today, World Wildlife Fund estimates that about 500 Siberian tigers roam through Russia’s far east. For Vladik’s release, officials picked a remote, densely forested, isolated spot by a river in the park. In the first video below, you can watch as his crate is set down and the door is opened. At first, Vladik remains inside, scanning the surroundings for potential threats. Then, he erupts from the crate and runs across the riverbank toward the fringe of the forest, where he disappears into the wild. The moment when Vladik transforms from captive tiger back to wild carnivore is quick. That’s why you may want to watch the second video, produced by two filmmakers from the International Fund for Animal Welfare. Published on January 21, 2015, it tells the story of how difficult it is to document such tiger releases. Most footage, such as that of Vladik’s release, show only fleeting glimpses of animals as they leave enclosures for the lives they were meant to live. 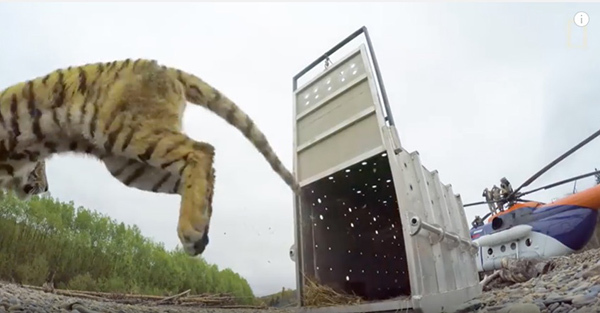 But in this 2015, super slow-motion, high-definition video taken of the release of a tiger named Zolushka, you’ll have the time to see all the beauty to be found in these heart-thumping seconds of justice.